The Colonial Conference has always been one of the toughest conferences for teams to win due to the number of teams. Every one of those eleven teams on any given day has the chance to come away with the win. The Lady Lions from Lindenwold traveled to Haddon Township to take on the Hawks. Haddon Township had won six of their first seven games and would add on to their winning ways. The Lady Hawks would erupt for six runs in the second inning to take control of this game early. Starting pitcher Katie O’Riordan would earn the victory when Township posted and 11-1 victory over the Lions. Each year there are players on a team from a conference that works hard both on and off the field looking to improve on their individual skills. Despite their team's record, those efforts alone make it hard to find indications that a team is not giving their "all" in their quest to come away with a win. Today's opponents, the Lady Lions from Lindenwold traveling to Collingswood, were looking to finish their season on a winning note. This would be the Panthers last game of the season and they would end it positively. Avery Roof scored twice for Collingswood helping the Panthers capture the 6-1 victory. It's always nice to get that first win of the season and both Lindenwold and Cherry Hill West were looking for during their second game of the season. Shaina Bradley would get the start on the mound for the Lady Lions from Cherry Hill West and she would get plenty of support. Kelly Smith would give Bradley an early lead when she hit her homerun early in the non-league softball game. The Lions would score all of their runs they would need during the first three innings. Cherry Hill West would pick up the 14-1 victory and even their record to keep pace in the Olympic Conference Patriot Division. When a team is undefeated and has to an opponent's home court, there are several challenges that have to be met. One challenge of course would be to keep the game on the court and not worry about the home fans. The other would be to stick to the game plan and execute well on the court. The Panthers from Collingswood would take their six game winning streak and extend it by one when they traveled to Lindenwold High School. Jon Dempsey's success during the first half would help Collingswood defeat Lindenwold by a 74-65 margin. Collingswood improved their record to 7-0 while the Lions record dropped to 5-2 early on in the season. Two teams took the field today with the confidence of picking up their first win of the season. Overbrook and Lindenwold were those two teams participating in a non-league field hockey game held at Lindenwold High School. Earlier in the week, the Lady Rams from Overbrook suffered a one goal loss in a game that could have gone either way. Lindenwold had played a strong game against powerhouse West Deptford on Tuesday but could not pick up the win. Against Overbrook, the Lady Lions would stay one step ahead in this fast moving, intense but exhausting game. Lisa Darji would score a second half goal to defeat Overbrook by a final score of 1-0. With the calmness of a stalking predator, the Lions from Lindenwold went out and impressed head coach Derryk Sellers in their opening day victory at Haddon Heights. Both teams were eager to get onto the field and start making contact to finalize the start of their football season. Lindenwold’s defense dominated both halves of this game while runningback Akeem Cartwright took care of the scoring chores for the Lions scoring the only two touchdowns of the game. 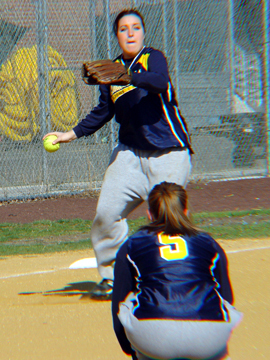 Lindenwold would post a 14-0 win over Haddon Heights in a Colonial Conference game. The game is soccer is definitely a team sport that every person on the team desires to come away with the win. Together, each player works hard in positioning themselves into receiving the ball and moving it down field for a scoring chance. That’s what Gloucester City girl’s soccer team had to do in order to control the tempo early against visiting Lindenwold in a non-league game. Gloucester would score the first goal of the game and never looked back. The Lady Lions from Gloucester would win this game by a 4-1 margin. Erika Smizer scored a goal and had two assists.